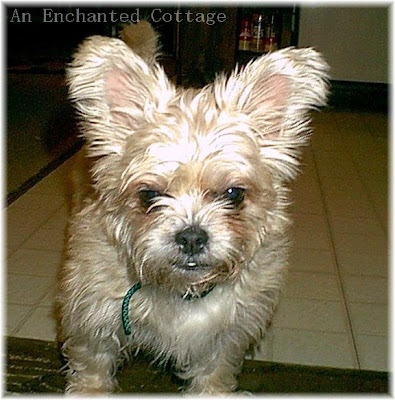 An Enchanted Cottage: Our little pound puppy (a.k.a. troll dog)!! 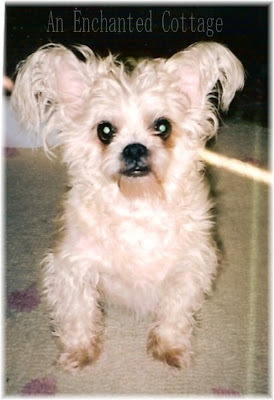 This is our little Ms. Giz (Gizmo, Gizzy Girl)... One look at her ears and you can probably guess why she was named Gizmo! 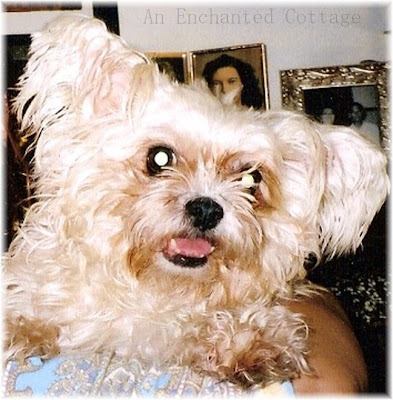 That was her name when we adopted her, at age 8, from a rescue group in Maine and this is what she looked like... a pair of ears with a dog attached!! Gizzy, true to her (mixed) terrier heritage, ruled the roost from the get go. It didn't matter to her that our three cats had been living here for years before she came along, or that her big brother (lab/shepherd Mr. O'Malley) outweighed her by 60 lbs.... She let everyone know she was the boss from day one! This story has a hero, and his name is Vaughn. He, along with another rescuer named Sharon, drove from Maine to the New York City pound several times a year. Their mission: to rescue as many small dogs from the pound as possible, take them back to Maine, and find homes for them. The NYC pound takes in about 1,000 animals every week, yet only about 100 of those are fortunate enough to find homes; therefore, about 900 of the 1,000 are put to sleep ... every week. The number are staggering, aren't they? While finalizing paperwork to adopt the dogs, Vaughn happened to wander into a back room where he spotted Gizmo in a cage. 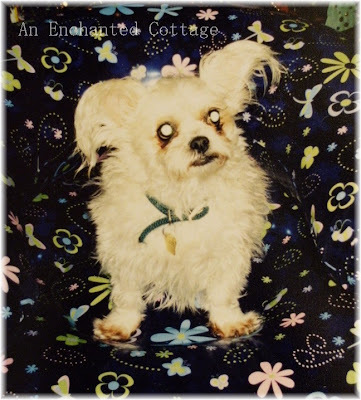 When Gizmo saw him, she immediately got up on her hind legs, clasped her two front paws together and kept thrusting them back and forth while barking furiously... Vaughn later told me that it looked to him like she was praying for her life. He went back to the front desk and told them he wanted to adopt the little blonde dog in the back room, too. 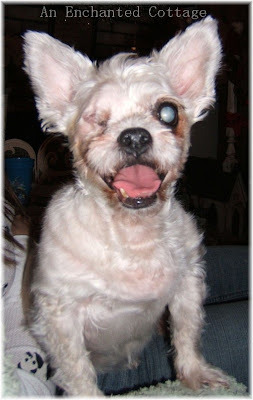 She eventually went totally blind in her remaining eye, but again, she lived each and every day joyfully, with a wagging tail and a crooked toothed smile... Nothing got her down. She had also developed diabetes (a contributing factor in her eye infection). Part of her treatment was me giving her insulin shots twice a day, once in the morning and once at night. Again, never a whimper. As long as she had her family (especially me), a bowl of food and fresh water, she was as happy as could be. She was a little girl, but she had a BIG appetite!!! I'm so thankful and grateful for the 8 years we shared. By watching her, we all learned more about living life with joy, dignity, and without complaint. And I'm so thankful and grateful to Vaughn for refusing to leave the pound without this little girl... Vaughn and Sharon are no longer doing rescues or I'd definitely send people their way... But wherever you live, you can be sure that there are local rescue groups, pounds, and shelters filled with animals, all in desperate need of good homes. I have several pet adoption sites listed on my sidebar where you can adopt everything from puppies to purebreeds to good old mutts!! And don't forget one of the major benefits to adopting an older dog - they're already housebroken in most cases!!! Wishing you and all your fur babies a wonderful week! You have me sitting here crying like a baby! I just don't understand how any one could say a rescue dog is not as good as one from a breeder. In my eyes there is no such thing as a dog to old to be loved. To sick to need a home or to ugly to be unwanted. I too am so thankful that you got to love your little guy for 8 years though I know they seem way to short. I once asked someone why God would have dogs die after such a short time on Earth and I was told it's so we open our homes up to more and more dogs to love. Just think of all the little fur babies we will have waiting for us when it's our time to go to Heaven. YES I do believe animals will be there! It wouldn't really be Heaven without them. At least in my eyes. Thank you for sharing the story of Gizmo. I've often seen her smiling face on the side bar and "wondered" about her. She was just as cute as could be and I'm happy she lived a happy and love filled life with you. Hugs as you remember, smile and perhaps even cry as you make your way through the times you shared. What a wonderful life you gave Gizmo. I know the ache left in your heart. Those fur babies fill a big void in our lives and fill our hearts with love. I know you take comfort in knowing you gave her a wonderful life in her old age. She looked so happy in all the pictures. I'm sure the love from that little dog brought you fun, peace, and adventure all the days of her life...and forever after. What a dear sweet fur baby. How great that she was rescued at the early age of 8! If only we could teach all people to cherish their pets no matter what age they are. Thanks for sharing this story of love. What a lovely story! Both of mine are rescue dogs too. We're very lucky here in the UK to have an organisation called the Dogs Trust, whoch is an adoption and rehoming centre but they have a policy never to put a dog down. 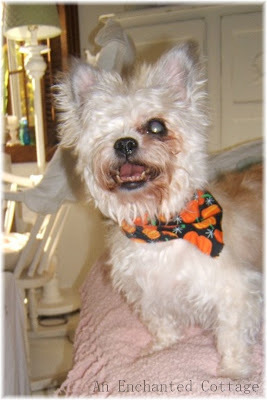 Poor Giz... Poor you..... We lost a dog to diabetes in 1999, thankfully before it affected his eyes. It's so hard to lose a pet and we never ever forget them. What a sweet story, Donna. We adopted a dog from our shelter almost two years ago, and our daughter named him Gizmo. He can be a rascal at times, but he and his feline siblings are the lights of our lives and I can't imagine what I'd do without them. 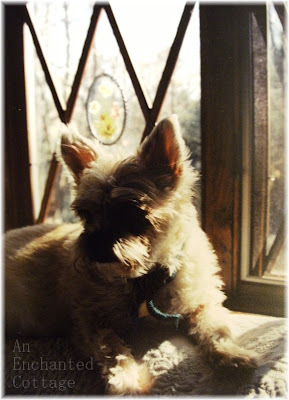 Thank you for giving your Giz such a wonderful life for the time you had her. What a sweet story and an even sweeter dog. I love every photo. What a lucky pup to have found you. There is nothing like the love of a rescue dog. Ours was Lady, a shizu aged five. A broken jaw and hip, only four teeth and her coat a mangled mess. Well she lived until she was eighteen and there was no love like hers. I still miss her. What a sweet memorial post. She was a beauty, and I'm glad she had angels looking out for her. I, too, do volunteer work with animal rescues. My heart breaks so often, and I am constantly frustrated with people who won't consider adopting from a shelter or rescue group. Actually, it makes me quite angry. I'm so surprised that the NYC pound would tell him she was too old to be adopted. If a person was interested, what difference is it to the pound?! I have 3 rescues of my own, and this week I have a temporary foster. She was an owner turn-in as well and is about 8 years old. She wasn't even put on the adoptable list! She's been with us for a week and is the best dog ever...sweet, calm, housebroken, good house manners, etc. It would have been such a waste for her to be euthanized. She was scheduled to be euthed last Wednesday. I got her out just hours before. Today, I'll be taking her to her long-term foster mom. I'm going to be sad to see her go, but I know she'll make someone a great friend! First, thank you for taking a pound puppy. I wish everyone would consider it. Second, oh my, tears. I just lost both of my beloved's last year as well and it's hard. 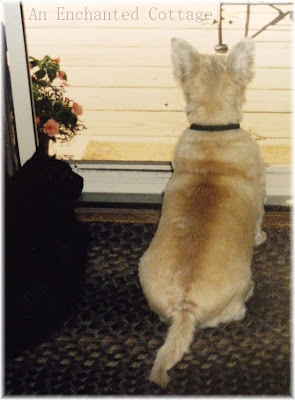 Not a day goes by that I don't think fondly on them and the memories they brought to my home. I miss them dearly. Your little gizmo looks to be quite the character. I hope that little pound puppy delivered enough memories to swaddle you today when the tears come in remembrance! Enjoy the memories. Oh your tugging at my heart strings. I'm a big fan of rescues either dogs or cats. Lately cats seem to be ruling. Rescuing should be in everyone vocabulary. 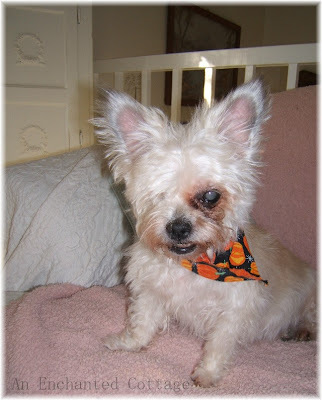 Thanks for sharing Donna and Gizmo is waiting for you at Rainbow Bridge. What a beautiful little girl! You both are so lucky to have found each other, it was meant to be. I'm sure she felt very loved while she was with you and your family. You gave her a good home and much happiness. 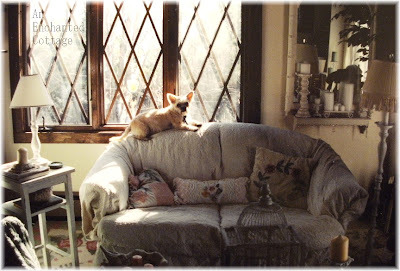 Donna....I´m sitting here with tears in my eyes....what a wonderful and loving story...a real Cinderella story for Gizmo´s part! I can "feel" your love for this fury little sweetheart, as well her love for you! When I see her pictures, with her twinkling stareyes...I want to "crawl" into the picture and just hug her! 16 years, 8 with you...truly a blessed little dog! Thank´s for your kind words on my blog...it really warmed my heart! Your story brings tears to my eyes...that rescue was meant to be. Giz came to you for 8 more years of loving. I feel sick when I think of all the dogs that aren't so lucky and how they all just want a home. Every being just wants to love and be loved. Bless you. I don't know if you noticed, but I followed your lead a while ago, and have links to pet adoption and welfare sites on my blog. You are such a wonderful animal lover, Donna. Gracias por contarnos esa historia tan bonita que es la vida de Gizmo. Yo también adoro a los perros, y no sabría vivir sin ellos. Tengo cuatro: Luna, Kiko, Kika y Willma. You gave Gizmo such a good life! Something that a lot of dogs never receive. Over the past 3 years we lost our dogs. Our husky was 16, and our two yorkies passed last year at 12 and 18. Three weeks ago I started looking at dogs on adoption sites and found one that just called my name. Someone just dropped him off at a park, but fortunately the person who found him is with a pet adoption organization. This dog will follow me everywhere and will even play fetch with you...his age? He is 9-10 years old. Everyone said why adopt one that is old, get a puppy! Well, we all need to be loved and just because we get old doesn't mean we don't need it anymore!!! So, for however long he is with us at least he can have a happy life!! No matter how many stories I read of Dog owners losing their fur babies, it always makes me sad. I just gave Alfie a huge hug after reading this Donna. Thanks for sharing. I just read this post to my husband and we got all teary eyed. What an honor to have been so loved by a wonderful girl like Gizmo. Nothing got her down. She kept on keeping on. She will live forever in your hearts and memories. Thank you for sharing her with us. It was an honor to meet her. GREAT POST!!! Anyone who rescues animals is a wonderful person in my book! In my opinion, breeders and pet stores should not be allowed to exist because of all the animals in shelters that desperately need homes. 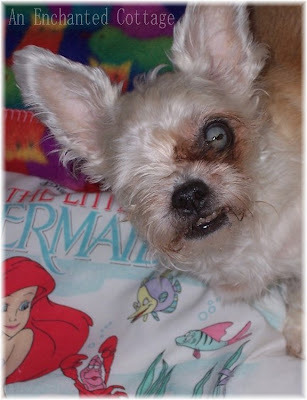 Thank you so much for sharing Gizmo's story. I do love this post Donna. How I love to hear a happy ending rescue story. One little moment can change an animals life forever, making all the difference between life and death. Glad you look back on Gizzy Girl with such fond memories. She surely was grateful for the life she had. These wonderful 4 footed family members of ours sure do leave an impression on our life, don't they? My heart is with you on this week of the anniversary of Gizzy's passing. What a wonderful story! I can't hardly believe that they didn't want to adopt that sweet dog out because of its age! So glad that they were finally persuaded since he had 8 more good years left! 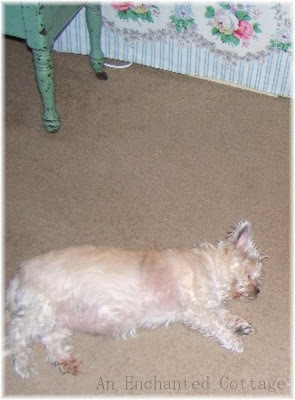 You gave Giz a wonderful home and you can tell that he was very well loved! What a sweet story, the man and the dog who never gave up. Animals sure know who they can trust. Both of my cats are rescues- one I got from a shelter and one I physically rescued. They are the best pets and I wouldn't trade them for the world. Donna, I just came to your blog from somewhere else. I'm so glad you all ended up with Gizmo. It was meant to be! Eight years of happiness and love! I just posted the other day about my cat and my visit to the animal shelter. My cat has disappeared in the last week. We are hoping for his safe return. You know 8 years is a good lifetime for any dog so she had 2 lives! What a great guy who would not leave her! I'm afraid I only have the strength to work with no kill facilities. I would have a million dogs and be thrown out of my little house if I went to a pound. I am greatful every day for my sweet Casey. I got her as a puppy (7-8 weeks), I was young and thought a puppy was a good idea. I always hoped all her brothers and sister were also adopted. I went through the area where the owner surrender dogs were and it just killed me. The dogs were so behaved and seemed sad. I have not gone back, I know I'm weak. But I have NEVER considered buying a "purebred" from a breeder or shop. I just can't. Thanks for sharing your story and for your side bar. Such a touching story! I love to hear about pups finding the homes they deserved. I can see why you miss her so much, she truly was special. I commented in 2009 when I met you. I'm such a fan of rescuing as you know. I just had to come back and see Gizmo one more time. Your stories of your furballs are wonderful! Animals really are the most wonderful friends. Giz is so cute and I bet she was just a bundle of joy. thanks for sharing!